October 30, 1964, after ten days of climbing, Tom Frost reaches the top of the North America Wall to complete the route’s first ascent (Royal Robbins). Yosemite Valley, September 1960. Royal Robbins, Joe Fitschen, Chuck Pratt and Tom Frost stand on a triangle-shaped ledge a few hundred feet up The Nose on El Capitan, setting their sights on making the second ascent of the route. To get there, they’ve scrambled up broken rock and ledges to the start of the route’s first pitch. Above them gleams 2,800 feet of glacier-polished, orange granite, sliced with black, dark gray and white streaks. Toward the top of the cliff’s highest point, a pink band of light touches the wall. I first met Tom Frost 20 years ago in Yosemite Valley during the summer of 1997, after running into his son Ryan at the base of El Cap. I recruited Ryan for a belay on a route, and later all three of us met for dinner. I continued to visit with Frost whenever there was a chance, often to share a meal in Oakdale and swap El Cap stories before continuing on to Yosemite. 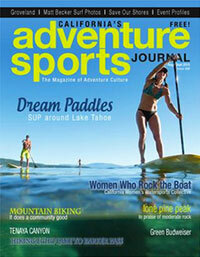 These include Frost’s Yosemite “Golden Age” stories from the 1960s. 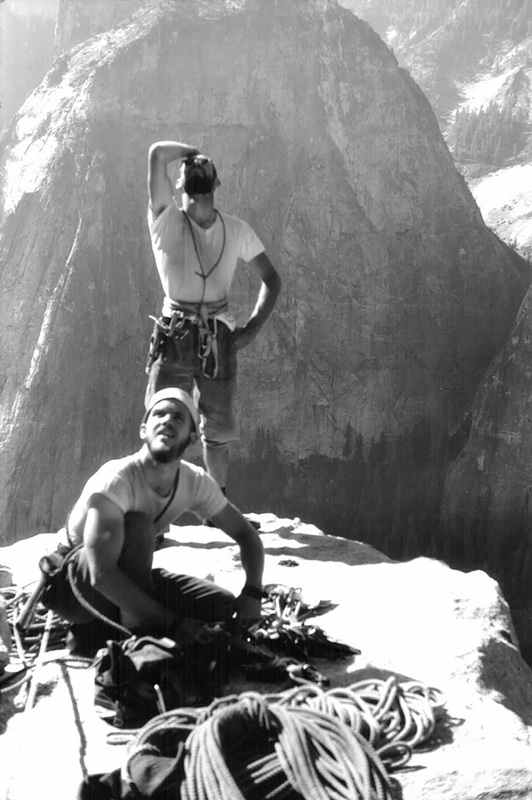 The Golden Age was an era of rapid change in Yosemite, with emerging techniques and philosophies from a small group of influential climbers. Few climbers had a bigger impact on the evolution of big wall climbing during this time than Frost and his partners Royal Robbins, Yvon Chouinard and Chuck Pratt. Tom Frost, the younger of two brothers, was born in 1937 and raised in Hollywood, California. 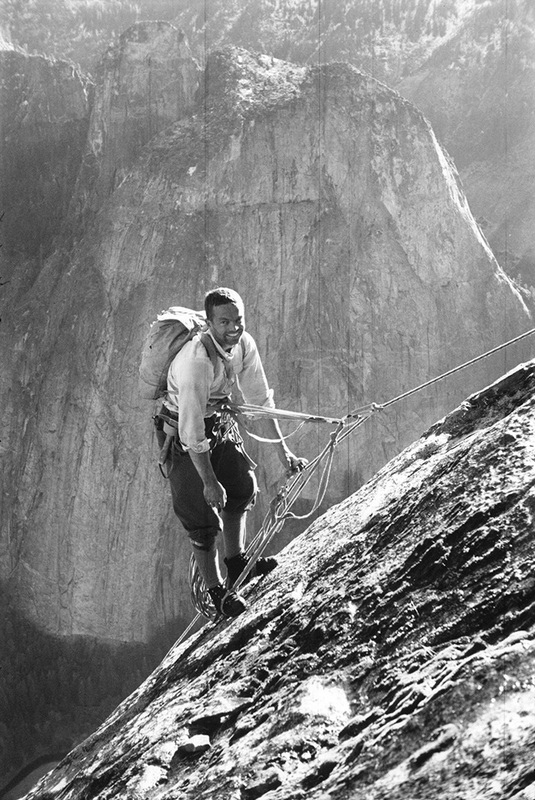 It wasn’t until his final year at Stanford University, where he studied mechanical engineering, that he discovered climbing through the Stanford Alpine Club. The group practiced climbing skills by top roping on the scrappy rocks around Palo Alto. 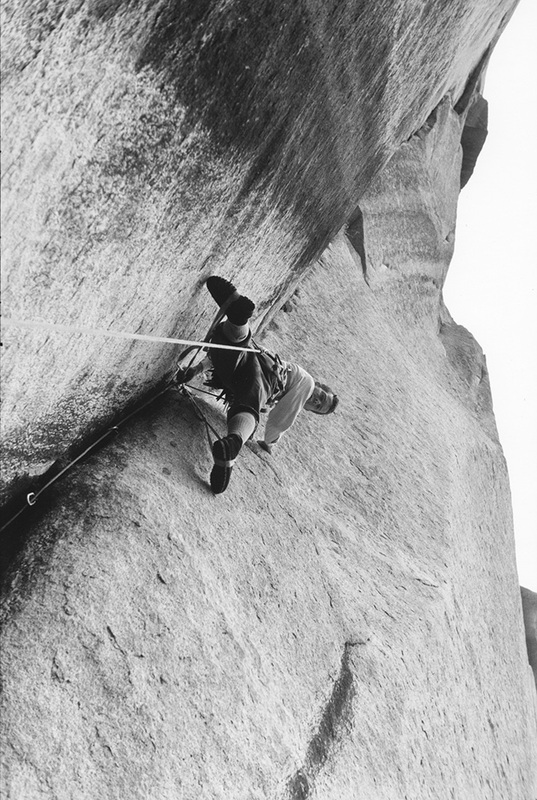 During his Yosemite visits with the Alpine Club, Frost noticed that climbers were working on El Cap’s Nose route. “We’d look up a million miles in the air and think, wow, Harding has ropes up there.” Frost graduated from Stanford in 1958, the same year Warren Harding, Wayne Merry and George Whitmore completed the first ascent of The Nose, an ascent spread over 45 days in two years. Spurred by the challenge to succeed on the Robbins climb, Frost trained by climbing on the windowsills on the outside of his parents’ house. 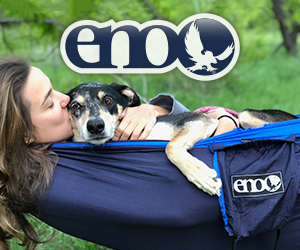 When Frost and his rope mates repeated The Nose — in what was only Frost’s second year of climbing — it took them a swift seven days. 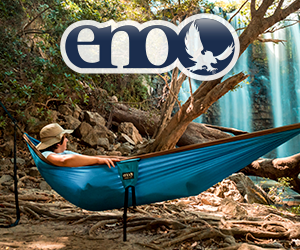 The ascent cemented a partnership between the four men that lasted the rest of their lives. 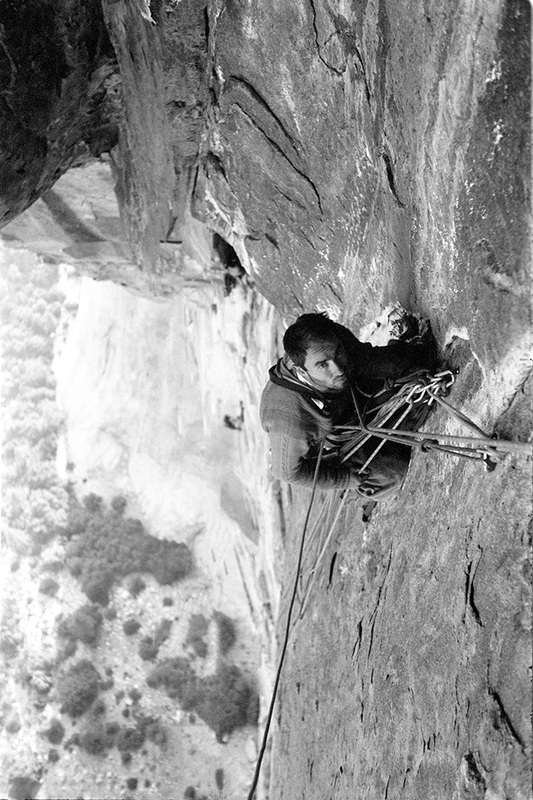 In 1961, Frost, Robbins and Pratt added a second route to El Cap, The Salathé Wall, a route still considered by many as the greatest rock climb in the world. In 1964, they teamed up with Yvon Chouinard for another first ascent on El Cap, the North America Wall, which was at the time the most difficult wall in the world. “These routes were life changing experiences and I spent the next 50 years trying to understand their importance,” Frost said. 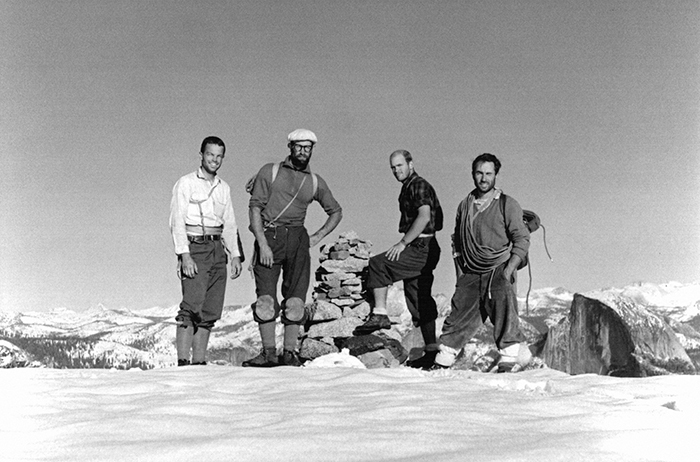 Frost, Robbins, Chuck Pratt and Yvon Chouinard on top of the North America Wall. Frost’s motivation to finally understand what he witnessed all those years ago is because he’s the centerpiece of two biographies. 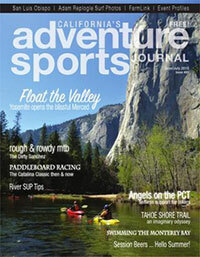 One is a coffee table book by Yosemite big wall first ascensionist and climbing historian Steve Grossman. The other is a documentary film project by Tom Seawell and Jeff Wiant of Flatlander Films. Flatlander’s film is about Frost and the Golden Age, and in addition, the team has captured 60 hours of interviews from the world’s top climbers on how Frost has influenced their climbing careers. Frost says that looking over the images from that era has helped him understand and recognize the influence those climbs had on his life as well as the lifelong friendships. 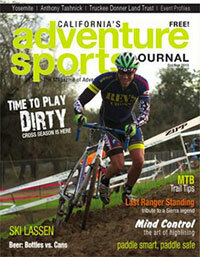 He recalls Chouinard and his considerable business acumen. “I used to call him The Chief.” He also remembers Robbins’ strong leadership and realizes it was Pratt who quietly influenced him to recognize the spiritual relationship between himself and the rock. “Most people’s eyes roll back in their head and they don’t have much to say. But you get it.” He lets out a huge laugh. Chuck Pratt passed away in Thailand in 2000. This leaves Frost as the sole survivor of the Salathé Wall’s first ascent party. Frost’s climbing contributions also include walls in the Grand Tetons, the Northwest Territories and steep faces in the Himalaya. His innovative gear designs in the 1972 Chouinard Equipment “Clean Climbing” catalog influenced rock climbers to lessen their impact on cliffs and preserve the resource for future generations. Frost also played a critical role in saving Yosemite’s Camp 4 in 1997. 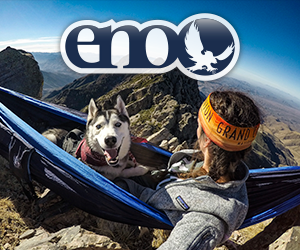 His legacy of significant climbs and dedication to Camp 4’s preservation earned him the Excellence in Mountaineering Award from the American Alpine Club in 2016. 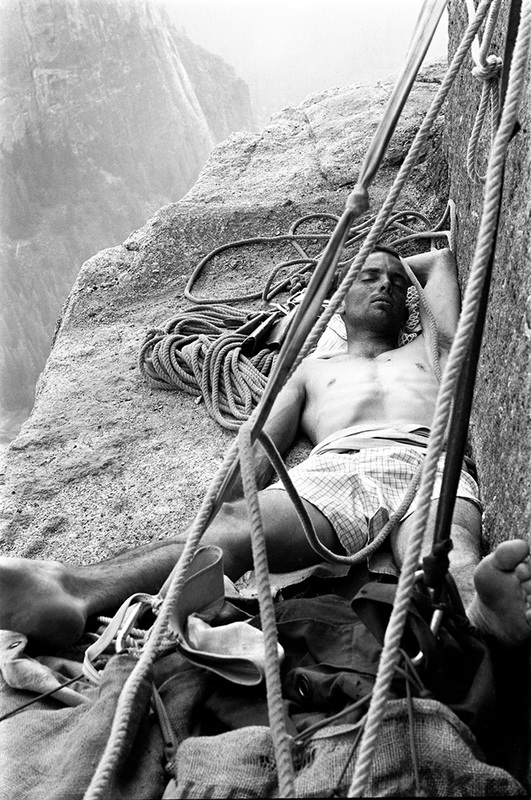 Frost belaying Pratt from a sloping Ledge during the first ascent of the Salathé Wall in September 1961. Pitch 23. 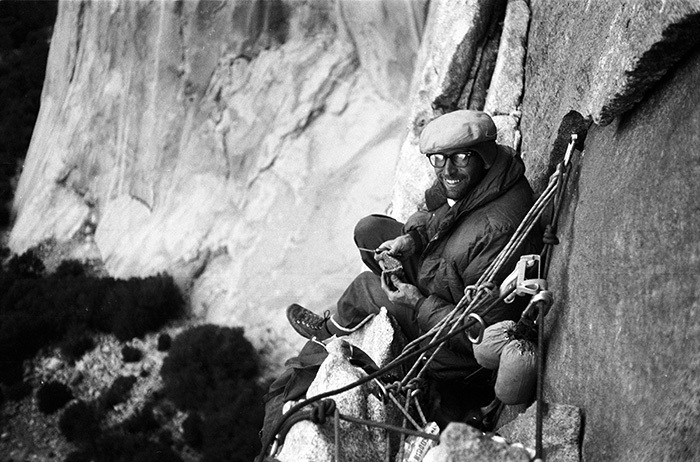 Chuck Pratt and Royal Robbins on El Cap Spire during the first ascent of the Salathé Wall in 1961 (Tom Frost). Frost exhausted from the previous day’s hauling efforts during the second ascent of The Nose, September 1960 (Joe Fitschen). Frost during the second ascent of the Dihedral Wall, June 1964 (Royal Robbins). 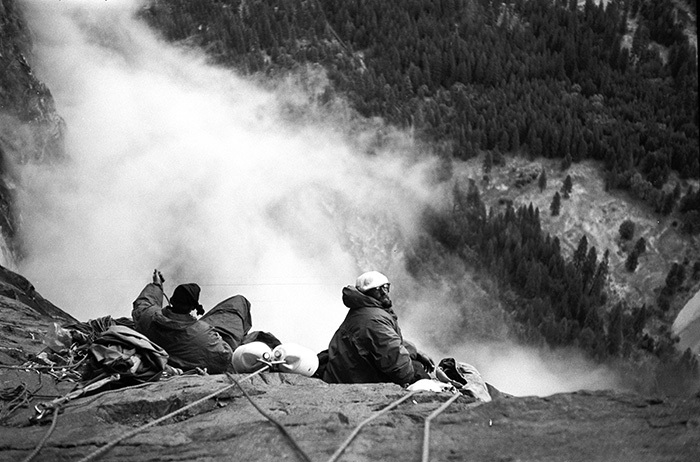 Pratt and Robbins arriving at the Cyclops Eye bivy on the North America Wall. End of Pitch 19. Robbins slicing salami on Mazatlan Ledge on the North America Wall. End of Pitch 4. 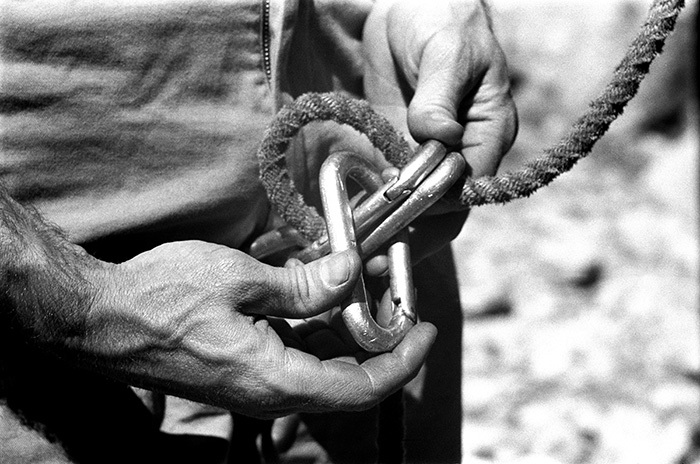 Unknown Yosemite climbing pioneer showing the construction of a carabiner break rappel used for descending a rope. 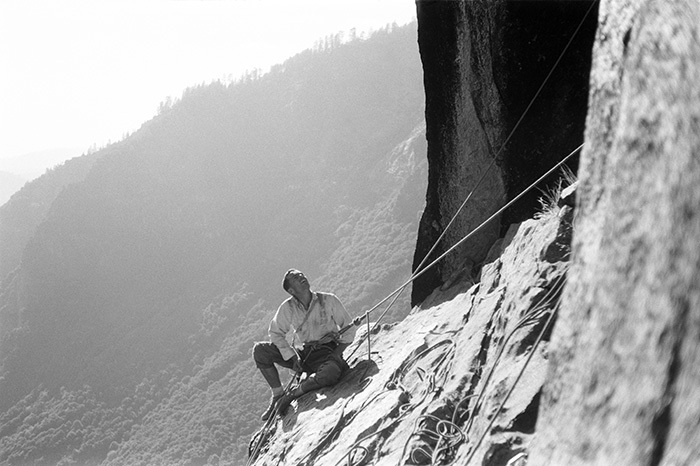 Yvon Chouinard at a belay in the Black Dihedral during the first ascent of the North America Wall. (Joe Fitschen).